Deb Mair has recently spent several weeks in South Africa. 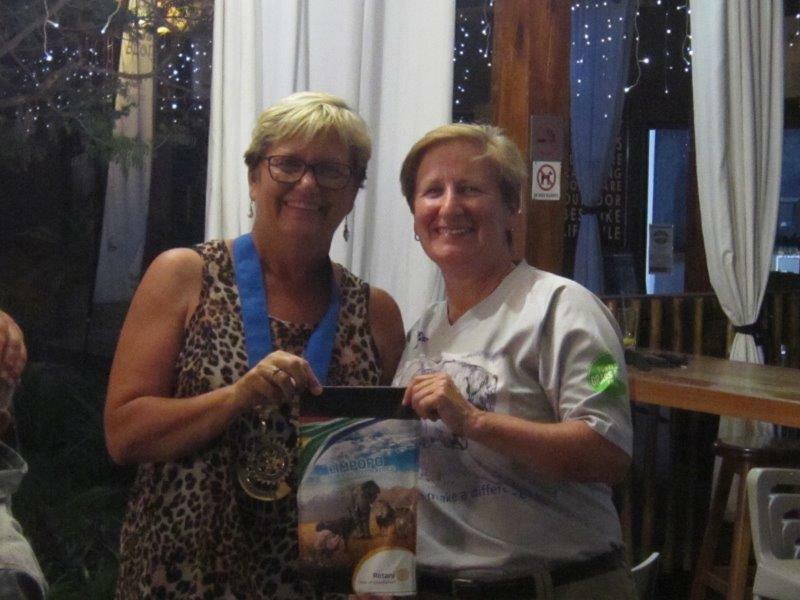 While she was there, she was supported by the Rotary Club of Hoedspruit whose President, Rose White, presented her with their club banner, which she duly presented to Plimmerton at their meeting on 21 November. She has come back with a wealth of knowledge about the situation over there, particularly with the Rotary Rotary Action Group for Endangered Species (RAGES) project, and also with a heavy heart after witnessing many sad situations, both with animals and with the people themselves. Heavy heart or not, she is inspired to do more where poverty and the lack of water affects more and more people and animals each day. She has many projects in mind that will require funding. Here are some of her stories. 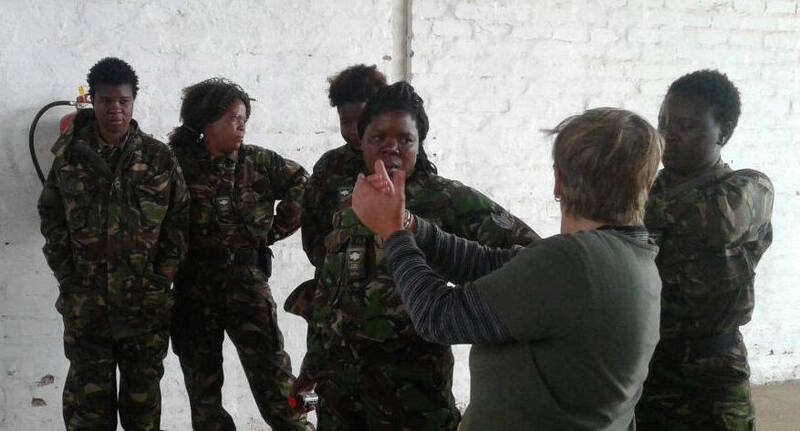 Part of her work over there was training the Black Mambas anti-poaching 'squad'. 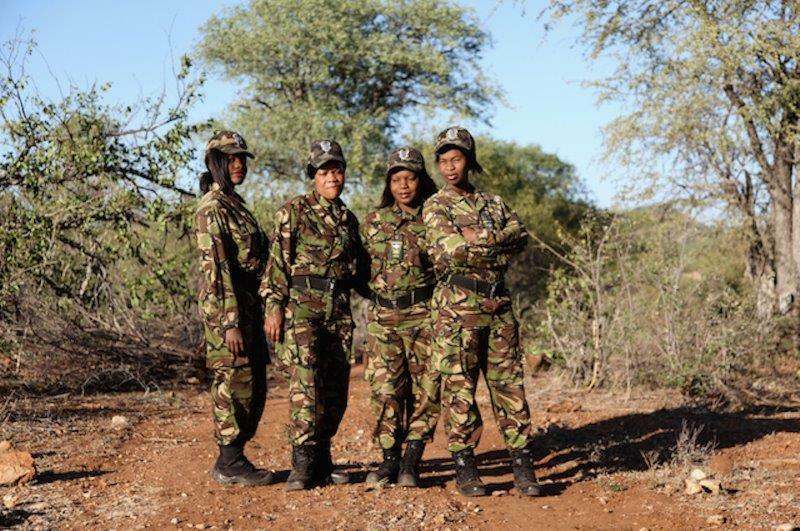 The Black Mambas anti-poaching strategy includes ‘visual policing’ through daily boundary patrols which are conducted on foot during first light and by vehicle at last light. Observation and listening posts are stationed in critical areas such as known entry and exit points or popular rhino waterholes for signs of poisoning. Disruptive patrols are performed within areas of high rhino density to thwart any attempts to poach rhino in our area. Road Blocks involve searching known and unknown vehicles for any illegal or suspicious items. They are an unarmed unit whose vision is to conserve and protect the rhino species and other animals on their land which will ensure sustainability and responsible tourism growth whilst protecting the environment and biodiversity of the reserve. The primary mission of the Anti Poaching Unit (APU) is to detect the presence of poachers and sound the alarm. An outside professional armed rapid response unit is on call per contract with Olifants West Region of Balule Nature Reserve (OWNR) once the Black Mambas detect an imminent threat. These women are from the local tribal trust lands where their culture is to stay home, clean the home and raise the children. The Bush Babies Education Program run by the Black Mambas is interlinked into the curriculum of 10 local schools to bring knowledge to life whilst raising awareness about their surrounding environment, providing a better understanding of conservation and leading to sustainable use of resources and ultimately installing an ethical ethos in our future generations. Debbie has been training them. The rapid rise in rhino poaching has been driven by an exponential increase in the illegal demand and black market price for rhino horn in south-east Asia, especially Vietnam and China. Poaching of Africa's rhinos has escalated exponentially from an average loss of 0.17 rhinos per day (a total of 62 rhinos) in 2007, to 2.04 rhinos per day (a total of 745 rhinos) in 2012 up to 945 in 2016. Rhino horn is nearly pure keratin, the same organic composition as human fingernail or hair (Hieronymus, Witmer, & Ridgely, 2006). 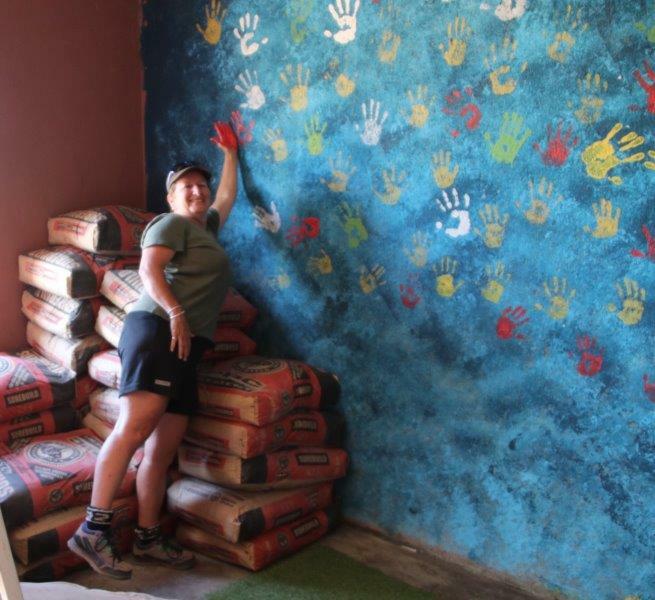 Apart from her work with animals, Deb also visited the Sigagula Children’s Centre which Rotary Hoedspruit has been supporting. 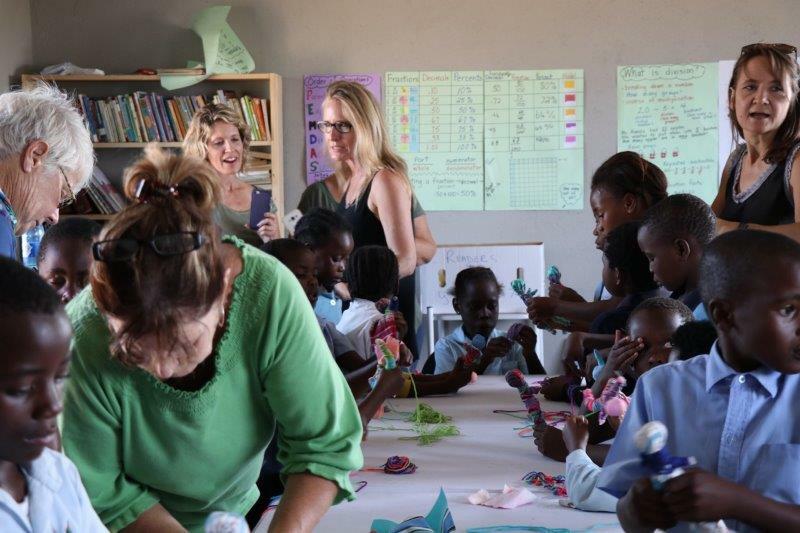 They visited and took gifts and educational supplies to the South African Medical Expeditions (SAME) which is a Rotary supported Project founded and directed by Shirley-Anne Beretta and her husband, operating under the name Sigagula Children’s Centre helping children with HIV and AIDs. SAME has medical volunteers who travelled to South Africa to provide medical services to children orphaned by HIV/AIDS. 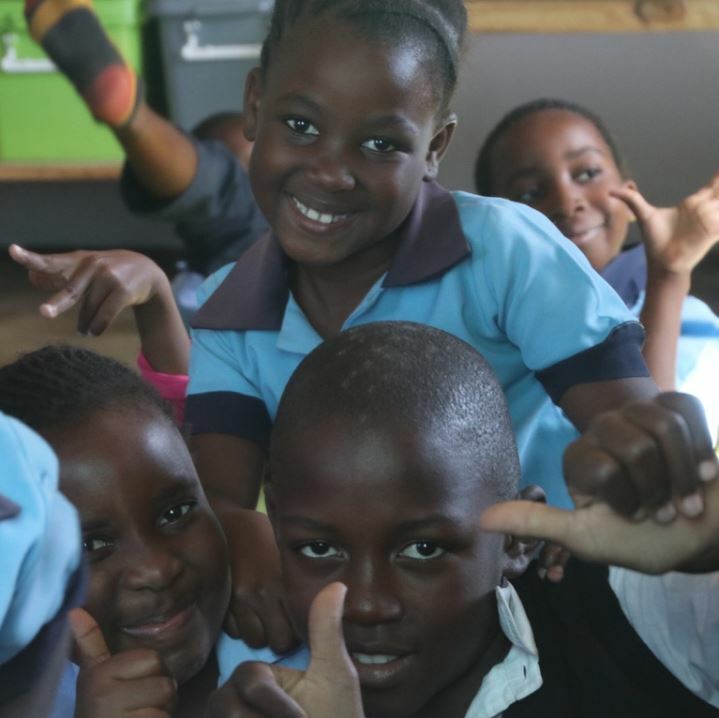 Through their relationships and cooperative efforts with South African providers, they are providing daily love, food, medical care and HIV testing and other medical treatment to orphans and vulnerable children. In addition, SAME outsources to nonprofits to maximize the effectiveness of their initiatives in the greater Acornhoek area of northern South Africa. SAME connects people by providing opportunities for those who want to help but don’t know where to start. They provide advisory, physical, and emotional support to local South African people and local South African nonprofit organizations to build local leadership. SAME raises funds to provide for the needs of orphans and vulnerable children of the Mpumalanga and Limpopo provinces providing Rotary with transparent monthly reports. Rotary Hoedspruit has fundraised to construct a third building to support these orphans. SAME need donations or grants to install water pipes and sinks in the new building, tile the floors and provide desks and shelves for the children. The third building is currently under construction. Deb believes this project would benefit from a club donation to completely finish the third building for the start of the new school year in February 2018. Her recommendation to Plimmerton Rotary club is to pay $3000NZD to go towards the cost of finishing off the building, tiling the floor, installing water pipes and a sink, and purchasing shelves and desks for the orphaned children. Deb has hopes to raise more funds to help the Black Mamba project operating on the Balule Nature Reserve. The Balule Nature Reserve (BNR) is modelled on a cooperative management system that employs the South African government management model ensuring alignment between public and private sector conservation interests. 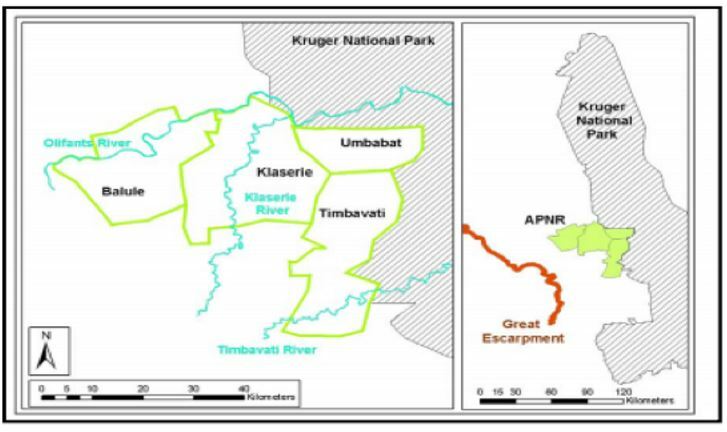 The map shows The Association of Private Nature Reserves in relation to the Kruger National Park. Water is needed for the staff, Mambas and volunteers to conduct research, patrols and environmental projects. Periodic searching for groundwater sources to improve the reserve infrastructure is ongoing. A water bore is needed in the northern area of Ollifants North to ensure that the patrolling Black Mambas have a constant water source for their 21-day deployment work schedule. The cost for this project would be $20,000NZD. Photos will appear on our Gallery as soon as possible. We are all super excited and there truly are no words to say how much we appreciate the donation, and more than that, your involvement and belief in us as a team. You are all amazing and this shall definitely complete all that is required for the upgrading of the building to clinic status. Santie has already moved certain clinic furniture into the new building and early in the new year we shall secure the building from the outside with burglar bars and security doors, establish both electrical and water lines to the building and equip it with what it needed on the inside. This is truly a dream come true for us as, since the school clinics became mobile, we have worked out of anything from a storeroom, extra classroom, office, daycare baby room etc, carrying the trunks backwards and forwards from a central point at our offices/home. Now we shall be able to consolidate and treat the children that really need our services on a more regular basis. I have received notification from the New Zealand bank that the request was made for the transfer and as soon as we start the upgrades I promise to keep you all updated with photos and information. This year has certainly been one of the most challenging our team has encountered and at one point we were all so tired and could not wait for December to arrive. Now I am anxious to get the clinic done and fitted with all that is required. Santie and I are like kids waiting for Christmas to happen. Debs, meeting you all has been such an honour and we cannot wait for you to visit again and I am sure by then we can proudly show you the fully up and running medical and training centre for the children. Sending you fondest regards and wishing your club the warmest and most wonderful wishes for the festive season ahead. 2018 is going to be a fabulous one. Note: The Sigagula Children's Centre run by South African Medical Expeditions (SAME) features in Rotary Showcase here. Remember that you have to log in as a Rotarian to see the projects in the Rotary Showcase. Original generation time 1.4705 seconds.